Artworks from Ann & Norman Roulet's extraordinary collection of Contemporary, African, Oceanic and ethnographic art are coming up for auction at Gray's Auctioneers . Post-war & Contemporary Art auction will take place on November 5th, and the African, Oceanic and ethnographic artifacts auction on November 6th. The Roulet's collection of contemporary art at auction on November 5th feature Andy Warhol's iconic screen print Moonwalk . This was one of the last prints made by Warhol before his death on February 22, 1987 and the first of a planned Warhol series on great moments in television, depicts Edwin (Buzz) Aldrin Jr. standing on the moon next to the American flag. Buzz Aldrin was a crew member on the 1969 Apollo XI flight to the moon which was televised live around the world. The Post-War and Contemporary sale spotlights Stanley Yulish's collection which includes Zhao Gang's large early abstract Black Dream an oil on canvas exhibited at Vorpal Gallery in Selected Abstract Work 1983 – 88, and featured in the exhibition's published catalogue. The enduring success of the artist's early abstract work is reflected in current auction results in Hong Kong on October 6th, 2014 where two smaller, early pieces sold for HKD $509,760 and HKD $339,840 respectively. 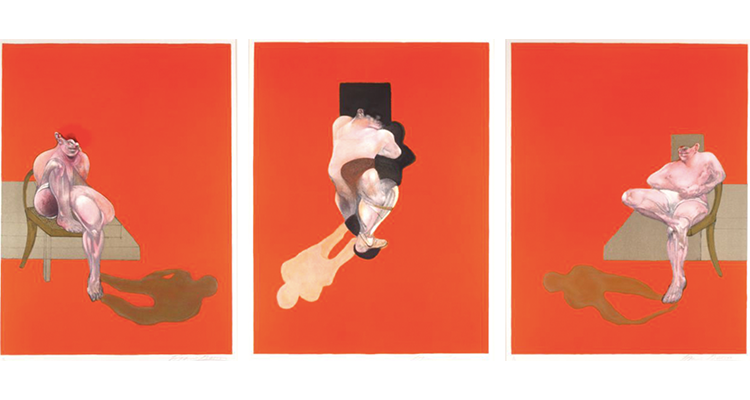 A private collector from New York has commissioned Gray's to sell several fine works including two Francis Bacon lithograph triptychs. One is Untitled from 1983, the second from the August Series is from 1972. This collection also includes Gerhardt Richter's Guildenstern, from 1998 on cibachrome between plexiglass and aluminum board; a rare Brice Marden ink on paper, untitled drawing from 1986; and a David Hockney lithograph, Rain, From the Weather Series, 1973. Boake and Marian Sells are collectors of Contemporary Art in Ohio. Artworks from their collection at Gray's include Steven Campbell's monumental Young Camper Discovering Grotto in the Ground. Exhibited at the Barbara Toll Gallery in 1983, Campbell created this work after arriving from his native Glasgow to study in Brooklyn at the Pratt Institute, the recipient of a Fulbright scholarship. Within days of the show, the doyen of the New York art critics, John Russell, fully endorsed the painterly qualities of a young, unknown Scottish artist in his New York Times review. Campbell died at only 54 in 2007. Sandy Moffat writes in his obituary for The Guardian, "His monumental paintings - vivid in imagery, complex in detail and rich in formal invention, depicting intriguing narratives inspired by the novels of PG Wodehouse and Bram Stoker - stunned Scottish audiences and artists alike. Never apologetic about his identity - "I'm the only one doing Scottish Painting" - he proceeded to explore and confront the varied extremes of the national psyche." The proceeds from the sale of the collection on Ann and Norma Roulet's African and Oceanic Artifacts, which takes place at Gray's on November 6th will benefit the Cleveland Institute of Art's new Ann & Norman Roulet Student and Alumni Gallery. The lots a magnificent Baga D'Mba carved wood fertility headdress from the Niger River Region in Guinea. Exhibited in 1992 at the "African Sculptural Traditions", exhibition in The John J. McDonough Museum of Art, in Youngstown, Ohio, the piece was also photographed for "African Masks: The Barbier-Mueller Collection" by Iris Hahner-Herzog, Maria Kecskesi & Lazlo Vajda (plate #22). Check out the entire sale here.